I seem to be confronted with young men and women representing non-profit organisations to give. These individuals are apparently being paid to do the job. There are the flag days where students are required to give their time to ask for donations for these non-profit organisations. What is volunteering today? Does being a volunteer means giving one’s time and energies to help the less fortunate or those in need by asking for donations from those around? It appears the non-profit organisations are creating jobs for individuals who are paid to ask for donations. Are they creating a glorified begging system? Gone are the days when volunteers gave out of goodwill — their time, money and energies. Today, people are being paid to volunteer. A classic example is the charity shows where celebrities are paid for their services. So it appears celebrities are doing good works but the truth is they receive an income in addition to their already well-paid celebrity status. Are these celebrities making a mockery of their fans? Now street vendors asking for donations are themselves paid to do the job of charity! The school uniform a student wears serves as an identity. Yesterday at a bus interchange, instead of queueing for the bus, a student in Nanyang Girls’ High uniform tried to cut queue. She thought by following an uncouth middle-aged man, no one bothered ticking her off. This student obviously did not take pride in her school — neither pride in herself! I have on occasions found students from the National JC or Hwa Chong JC loudly talking to one another or laughing away creating such din on a bus. They were not respecting themselves or other passengers already seated there! Also, girl students from Raffles JC loitering on steps at Takashimaya. Once I tried suggesting to these students that if they had wanted to loiter, to do in more discreet fashion — either they changed into their home clothes or go to parks or sit around benches provided but not littered themselves on floor or on steps. Yesteryears, we were proud of our school uniforms. Girl students would bring their home clothes to change after school if they had wanted to loiter. Gone are the days when students from better or more elite schools cared if they bring shame upon the school or themselves. A sign of low self-esteem?! Is social etiquette lacking? Where is the gracious society that we’re talking about? Economically, we might be first class; social etiquette…? Or, is this freedom of expression? Are you one of those who were taught in schools that we keep to our right when we walk up and down the stairs or along the corridors? This way, should there be an emergency, students would keep to their respective side of the walking space. Then there will be no pandemonium! Today, one finds every one walks in the direction as one wishes. Most times, the individual meanders from left to right or, right to left. Walking or jogging on the left or right of the road depends whether the individual is listening to his own body instinct or the influence of the West — i.e. North Americans (walk on the left as they drive on the left) or British (on the right — right-hand drive). Can Singapore discipline the young in schools to walk in one direction and on one side of the pavement? Will Singaporean families be considerate to walk in 2 files, especially those family members who would sprawl themselves across the pavement even when these were able to see an on-coming human traffic? The new Singaporeans have become an ugly society! They leave their things everywhere. They make use of air-conditioned places for their own conveniences. Take for instance, many school girls will leave their bags in one corner of the library and chat away in another location. The library has become a place for socialising rather than for reading! These young do not respect the purpose of a place. The library officers have little authority to discipline the public users — then why bother employing officers? Are these officers there for show or puppets? Or are they there for the public to make fun of their existence? Has Singapore become a place of irk? Has the officers no right — only the public? Sic? Are the new Singaporeans becoming a really ugly society? Is Singapore becoming an ugly place to live in or even visit by the tourists? Where is the graciousness? Where is courtesy? Wenchuan earthquake claimed 40,000 to date… The air was filled with ammonia and lime powder to prevent epidemic resulting from the decayed under the inaccessible rubbles. 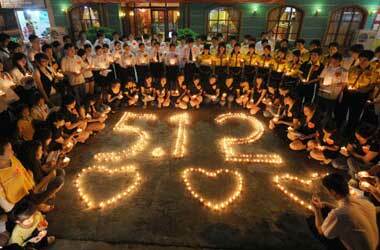 On 19th May at 2.28pm, China called for a national 3 minutes silence with sounds of air-raids, honks of cars and ships to observe those who died at the 8.0 richter scale earthquake in Sichuan; and a 3-day national mourning for the victims — all entertainment events canceled and the Torch Relay delayed and the television personnels to wear black. The photos above showed kindergarten and school students taking the 3-min silence as many schools around Wenchuan and those closest to the epicenter of the quake collapsed or buried under the rubbles. 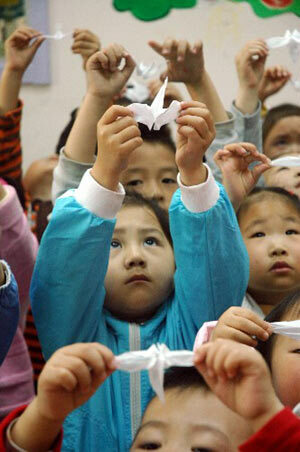 Many students died — a new generation disappeared under the China’s one-child policy.